Anquan Boldin remembers the abrupt, merciless end to the Baltimore Ravens' 2011 season, and the helpless despair he felt on that cold evening in Foxborough, Mass., a year ago. Most vividly of all, he recalls the inconsolable tears of teammate Lee Evans, whose failure to secure an apparent game-winning touchdown pass from Joe Flacco helped send the New England Patriots to the Super Bowl – and the Ravens into an offseason of deep, searing disappointment. Evans, signed by the Jacksonville Jaguars as a free agent last April and released four months later, is out of football now. The Ravens, despite a steady succession of obstacles since last January, are back in the ring to take another swing: On Sunday, Boldin and many of his 2011 teammates will return to Gillette Stadium for an AFC championship rematch against the heavily favored Patriots, and they'll do so with a healthy appreciation of the opportunity they squandered 12 months ago. "I think what you're seeing is [a byproduct of] what this team became last year, [beginning in] the locker room after the loss in New England, and with the way the loss went down and the way we handled that," coach John Harbaugh said earlier this season. "It was one of those things that just brewed in us and brewed in us for the offseason, and a good thing came out of it." Even if the Ravens fall short again on Sunday, Harbaugh and his players deserve credit for having clawed their way back to the brink of a Super Bowl, a journey culminating in last Saturday's improbable, 38-35 double-overtime victory over the top-seeded Denver Broncos. In the process, the AFC North champions fought through an inordinate share of adversity, bonded by the conviction that they could parlay their near-miss in last year's conference-title game into an even more special season. Baltimore's bad luck began in May, when star pass rusher Terrell Suggs tore his Achilles' tendon, an injury that doctors believed would likely cause him to miss the entire 2012 campaign. Suggs, in what Harbaugh referred to as a medical "miracle," returned in October, explaining earlier this month that "the way last year ended, I wasn't gonna sit out this year. We have a team that is very special. I knew we might have an opportunity to do something great, and I wanted to be a part of it. So, shutting it down was not an option. I had to get back with my team." In September the Ravens improved to 2-1 with a dramatic, 31-30 victory over the Patriots the night after wideout Torrey Smith's brother, Tevin Jones, was killed in a motorcycle accident. Smith caught six passes for 127 yards and two touchdowns on a Sunday night steeped in emotion. Three weeks later the Ravens lost their top cornerback, Lardarius Webb, to a season-ending knee injury and their locker-room leader, Ray Lewis, to a torn triceps that was supposed to shelve the future Hall of Fame linebacker for the year. Lewis, however, defied the doctors' initial estimates and returned for the team's first-round playoff victory over the Indianapolis Colts, four days after informing his teammates that the 2012 season would be the "last ride" of his phenomenal career. In between, Baltimore soldiered on through a contentious, late-October team meeting in which several veterans challenged Harbaugh; a late-November game against the Chargers that required a fourth-and-29 conversion to force overtime, with an unlikely screen pass to Ray Rice paving the way for an eventual victory; another potential season-ending injury for Suggs, this one a torn biceps in early December that he was able to play through; the stunning mid-December dismissal of offensive coordinator Cam Cameron, who was replaced by quarterbacks coach and neophyte play-caller Jim Caldwell; and a late lull that included four defeats in the Ravens' final five regular-season games. Through it all, the Ravens seem to have become stronger, more resolved and completely and collectively committed to the cause. "I think this is a special group, period," Boldin says. "For me, not only are we talented on both sides of the ball, but there's just a special bond in the locker room. There's so much we had to overcome this year, from Torrey losing his brother, to losing Suggs and Ray and Webbie. As a team, I think we've stuck together and gotten through it and come out better for it." As devastated as the Ravens were in defeat a year ago, the attempt to channel their emotions toward a positive reaction began almost immediately. In the locker room at Gillette after last January's defeat, Harbaugh said some encouraging words to the team, and then Lewis gave an uplifting speech that implored his teammates to "come back and go to work and make sure we finish it next time." Continued Lewis: "This right here makes us stronger. Let's understand who we are as a team, let's understand who we are as men, and let's make somebody smile when we walk out of here. We got the opportunity to keep going, men. Let's be stronger as a team, men. Let's be who we are." Of course, given the constant turnover that occurs in the 21st century NFL, the Ravens knew they wouldn't be completely the same. Cundiff, for example, was released before the season; he's now on the San Francisco 49ers' roster, though he was inactive for last Saturday's playoff victory over the Green Bay Packers. Suggs remembers getting a long postgame embrace in the visitors' locker room at Gillette from linebacker Jarret Johnson, who would sign with the San Diego Chargers two months later. "When we got to the locker room, there was just silence," Suggs recalls. "Nobody talked. I remember Double-J hugging me. I was just shocked, trying to grasp it. Then Ray spoke. And the work to get back next year started then." The 2012 Ravens have worked hard to become the type of resilient, resurgent team Lewis hoped they would. However, this is not to say that they got over the defeat in Foxborough quickly, or easily. "I still haven't watched the game," says Boldin, who conceded he has thought about it at least once every day for the past year. Says Suggs: "In the offseason, I thought about it every day. And I'd be lying to you if I told you I didn't think about it often [still]. But you can't live in the past. If you live in the past, it can destroy your future. You can't drive looking in the rear-view mirror." 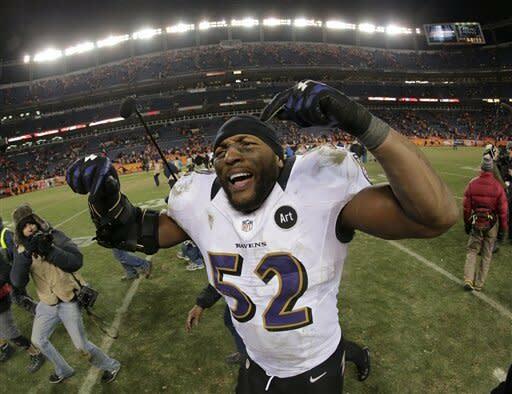 On Sunday, for the second consecutive year, the Ravens' potential road to the Super Bowl must go through Foxborough. Clearly, the distasteful feeling they experienced there last January was a driving force in launching their return trip. "Yeah, definitely, it's something that drove me all offseason," Boldin says. "When you lose like that, it's gut-wrenching, heartbreaking and tough to get over. But when you suffer a loss like that and get back up and have the courage to fight again, it's really powerful. • Jay Hart: Why is Lance Armstrong admitting he used PEDs now?